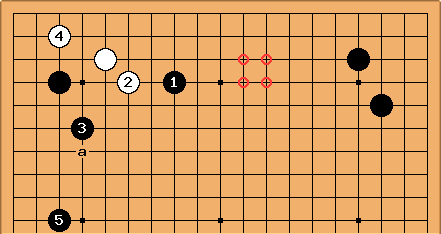 The reason for the popularity of White 2 in this enclosure opening position is that after White 4, White's group is actually alive. 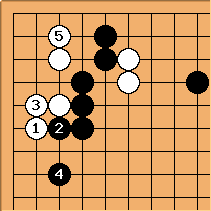 Black 5 is required to finish the joseki, so White has actually achieved that in sente. (If Black wants to take sente here, the normal idea is to play more lightly, with Black 3 at a). Since White's strategy in the medium term is to invade in the area of the marked points, White's idea of making life on the left corresponds to wanting only to have one weak group on this side (see do not create two weak groups). White has made few points in the left corner, but that isn't the major point. Now White plays a or b. 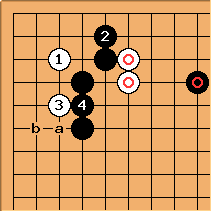 While a is the more common play, White at b is used when White wants immediate life, settling the corner group. This is a standard sequence for White to make life in the corner. White will play this way in order to turn next to the defence of the outside stones, having given Black a minimum of plays that affect them. White 1 played this way is normal, but White will have to play further moves on the left side, and Black will have a stronger wall. 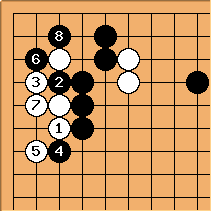 You could say that making immediate life relates naturally to the karami idea: you don't want to have two weak groups in the same part of the board. settling one group denies the opponent the chance of making double-purpose attacking moves. The first example applies this to a possible weak group and a virtual group, thought of as a possible future invasion. The second example relates to an invading group and an existing weak group. The example at 4-4 point one-space low pincer invasion, interception, hane underneath is similar to the second.